She was born in Town of Hutchins, WI on June 19, 1926, a daughter of the late William R. and Emma (Kielman) Fandrey. Cora married Marvin C. Schultz on September 22, 1951 at St. Paulus Church in the Town of Almon and together they raised one daughter, Jane. The family made their home in Gillett and Cora worked at the Canning Factory during the summer for many years. 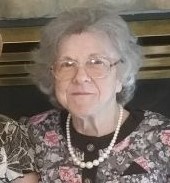 She was a longtime member of St. John’s Lutheran Church and was active in many ministries including the Ladies Aide and the church’s annual bazaar. Cora loved flower gardening and looked forward to planting flowers each year. Cora leaves her daughter, Jane (Randy) Bigelow, her grandchildren: Debbie Bigelow (Nate) and Robert Bigelow; her great-grandchildren: Kyle Mikula (Brandi), Breanna Mikula (Dylan), Ayden, Leah and Fisher and her great-great-grandchild, Emerson. She also leaves many nieces and nephews, other relatives and friends. Cora was preceded in death by her parents, her beloved husband Marvin on March 8, 1993, her siblings: Ada (Al) Umland, Emmaline (Ed) Kuehn, Derwin (Helen), Norman (Caroline), Donald (Bernice) and an infant brother Arnold Fandrey. Friends and relatives may call on the family on Friday, March 22, 2019 from 4 to 7 PM at LEGACY FUNERAL CHAPELS (108 E. Main Street, Gillett, WI 54124). Visitation continues Saturday, March 23, 2019 from 2 to 3:45 PM at ST. JOHN’S LUTHERAN CHURCH (101 W. Main Street, Gillett, WI 54124). A funeral service will follow at 4 PM with Pastor Kent Wallace officiating. Burial will be in Wanderer’s Rest Cemetery. Cora was one of the sweetest women I’ve ever known. She always had a nice smile and friendly greeting whenever I saw her. She was so proud of her family and beamed when talking about you all. We sure will miss her pecan pie. I’m sure they are enjoying it in heaven Love, thoughts and prayers to all of you! Cora you will be missed. Jane—-So sorry to hear this and would be there for you if I could. Prayers to you and all your family.